We decided to do another Twitterview and give fans the opportunity to participate. I like these because they're informal, relaxed, and directly from the source. What struck me with India's twitterview is the amount of love she got from fellow artists. I witnessed this at a recent show of hers as well. She practically brought out every artistic being in the city. So, what is it about India that produces that draw? Who is she? What makes her the artist she is today? What can we expect from her? India answered all of that and some in our twitterview, you can check it out below! KayKi: It's time!!! #IndiaShawn #IndiaSpeaks!!! Live Twitterview! First off thanks for taking the time to chat with me today @IndiaShawn! India Shawn: @KayKiSpeaks My pleasure!! KayKi: @IndiaShawn now, we've been following your career for quite a while. For those who haven't give us a little history on your journey so far. India Shawn: @KayKiSpeaks In 140 characters?! Ok.. Here we go! Started singing in church, moved to Atl at 15, started recording and performing then started writing and formed a team called Full Circle. We signed a publishing deal with Polow Da Don & UMPG. Wrote for a ton of artists including Monica, Chris Brown, Lloyd, & El Debarge. Then in 2012 I put together my first solo album ORIGIN..Now here we are today in the Outer Limits celebrating the release of my collaborative EP w/ songwriter James Fauntleroy! KayKi: @IndiaShawn @JayMcSwain I don't think that’s generic at all! Thats why the music reaches people like it does! Great question Jay!1 thing I noticed & this is evident in the questions being submitted today is you have sooo much love from other artists @IndiaShawn. India Shawn: ·@KayKiSpeaks Yes! I feel like most of my fans are aspiring artists, writers, and producers. KayKi: Tweeting of artists.. Let's get Joy's question in. This is always a fun one! I've heard of some interesting rituals. RT @jOyFul_SiNgS Do you have any unique rituals that you do before you go into the studio? India Shawn: · @KayKiSpeaks @jOyFul_SiNgS Lol Hey, Joy! Nothing too crazy. Maybe a few jumping jacks and some hot water with honey. Now tell me yours! KayKi: @IndiaShawn @jOyFul_SiNgS Haha! Jumping Jacks and honey water aren't too bad at all... lol. When it comes to shows are you usually anxious before them? Your latest show here for the #OuterLimitsEP release was everything. You seemed calm cool & collected. KayKi: @IndiaShawn I literally just laughed out loud. Tweeting of shows.. The support & love for you is real!! Are you ever shocked by it? India Shawn: @KayKiSpeaks It's so real, and it's growing daily! I wouldn't say I'm shocked because I've been at it for 10 yrs! I'm just GRATEFUL. KayKi: @IndiaShawn it has to feel amazing. I found out an old friend of mine is a huge fan and it made me smile. You're reaching more people daily. India Shawn: @KayKiSpeaks Thanks to people like you who give me a platform to share my story and music! KayKi: I'm a fan tbh lol. Now here's a really good question from another artist! @IndiaShawn RT @THEWHATLEY which should come first the, words or the music? India Shawn:@KayKiSpeaks @THEWHATLEY It's all about preference! I think people should experiment w/ different methods rather than sticking to a formula...unless you're R. Kelly lol. India Shawn: @KayKiSpeaks The coolest part was just being awestruck by everything @fauntleroy did. KayKi: @IndiaShawn @fauntleroy I bet. I'm a huge fan of his as well, so when I heard yall were teaming up I freaked! How did that come about? India Shawn: @KayKiSpeaks We've been friends since MySpace was poppin. 'Neither Do We' from Origin was our first real collab. People wanted more! KayKi: @IndiaShawn yes! I was one of those people! lol Do u grow more confident the more u record? Was this process more comfy than Origin's? India Shawn: @KayKiSpeaks Origin took a year; Outer Limits took a couple weeks lol. Confidence is certainly a factor, but you learn to make the art and then put it out. That's the point. Perfection is impossible. Gotta keep creating! India Shawn: @KayKiSpeaks Ummm.. Can't decide between 'More or Less' and 'Mermaid Song'. KayKi: @IndiaShawn Stevie is everything!!!!!! You released the #WonderfulEP recently in his honor & it jams. What is your favorite Stevie song? India Shawn: @KayKiSpeaks You & I ! :) Somebody has to sing that at my wedding. KayKi: & I'm sure you'll find somebody to do that! I always love to ask this question in interviews, who is @IndiaShawn listening to? What present day artist do u dig? India Shawn: @KayKiSpeaks My friends just put me onto this girl Rukhsana Merrise. She's pretty incredible. Been on her soundcloud lately. India Shawn: @KayKiSpeaks I hope so! KayKi: @IndiaShawn I really appreciate your time today! Before you go I was recently asked if you'd be touring soon. What can fans expect in 2015? KayKi: @IndiaShawn yes! yes! One thing is sure, the people are wanting to see and hear more of you! Im so happy to have been watching this unfold! thanks for taking the time to chat with us today! Truly appreciate it & you know we'll be looking out for more from you! KayKi : Aww! My pleasure! KayKi: Way fun! 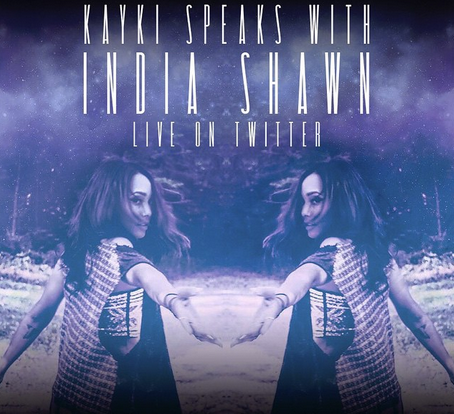 RT @IndiaShawn: Just wrapped up my first Twitterview with @KayKiSpeaks ! That was cool. i really liked reading this too bad im not on twitter maybe i should be. i remember her from last year on your blog.